Summer is a time when folks often invite freedom and creativity back into their busy lives. Maybe they pick up a project that has taken a back seat, take a workshop, or reconnect with a lost skill, art or craft. Maybe they learn, read, or try something new. Summer is a great time to nurture the young inventor in each child. The long days of the season allow more time to drop into open-ended, free and constructivist play. Making time for STEM concepts, for inventing and engineering can tap into imaginations, foster creativity and enhance problem-solving capacities. You can try offering this space to them by spending some time exploring, asking questions, creating and building. Allow for simple invention and engineering projects by providing tools and materials such as items found in a junk drawer, recyclables, or simple office supplies. Once you have ignited their passion for inventing, try stretching their thinking with various books. This is a great book a child’s brilliant idea to bring it to the world. After reading, you can begin by asking what an animal needs to survive. Then you might ask what more the animals need to grow and thrive. Continue the discussion by likening animal growth to “idea growth.” State that our ideas can grow, thrive, survive, and evolve by nurturing them. Follow up with a discussion about the author’s message: stick with your idea, follow it through, persevere and your idea could change the world. Next time you read with your child, you can try reading Not a Box by Antoinette Portis. This is a fabulous book about a rabbit with a very BIG imagination. After completing the book, you can discuss with your child how imagination and creativity are magical elements of who they are. Talking about different perspectives allows children to see that showing and sharing are part of what makes them unique and special. Next, lay out a box of recyclables or knickknacks and let your child choose one or more items to repurpose. Ask your child to reimagine how this ordinary object can become extraordinary. Encourage them to use their artistic skills to reimagine it by creating something new. You may also want to extend their learning by inviting them to use the materials and resources to create a 3-D representation of their new invention. Once they have finished, it’s always quite powerful to spend time reflecting about it together. Children appreciate “thinking outside of the box.” They thrive off of creation and love to deep dive into their own imaginations. 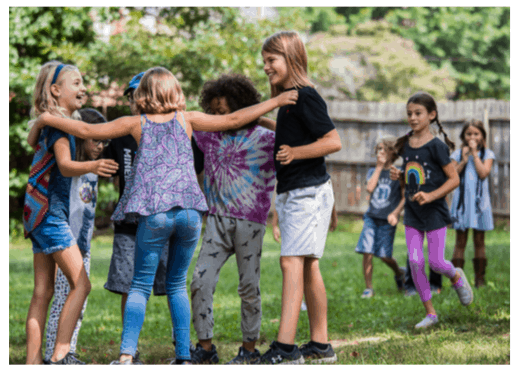 They approach STEM activities, such as this one, in the most authentic way when they know that their learning environment is supportive and safe. Children are most creative when the learning environment highlights many perspectives, emphasizes process over product, and failure as opportunity. Rites of passage are important, sacred ceremonies that highlight a transitional period in a person’s life. In many cultures, tribes and soceities around the world, children engage in various rites of passage. Often these are times when a child is recognized for passing though the threshold toward adulthood. Graduation at Rainbow Community School serves as an integral rite of passage for our graduating Omega Middle Schoolers. These opportunities, although grounded in the safety of community, encourage personal identity development, person spirituality and ultimately- wholeness. According to decades of research by Dr. Lisa Miller, head of clinical psychology at Columbia’s Teachers College, teens who have the benefit of developing a personal spirituality are 80% less likely to suffer from ongoing and recurring depression and 60% less likely to become substance abusers. To that end, it is reasonable to suggest that spirituality is indeed the cornerstone for mental health and human well-being. Intentional rites of passage are but one way to nourish that health. Graduating Omegans write commencement speeches that reflect on their time at Rainbow and acknowledge their gratitude, growth, challenges, hopes and dreams. Each student, as part of the rite, share these speeches publicly. This public sharing is an amazingly brave yet vulnerable challenge. But more importantly, the words of wisdom spoken by these young adults are nothing less than profound. They are informed by years of social, emotional and spiritual engagement and learning. They are guided by opportunities to explore life’s big mysteries and ponder personal purpose. They are rooted in a a collective AND personal identity. If you are curious what happens when soul is invited into the classroom, please click here to listen to Noah Mraz’s graduation speech. What are the implications of integrating rites of passage, existential questioning and the spiritual domain into your own work with children? What are you already doing that serves the spiritual development of your students? What more can you do? The integrated RCS curriculum fosters learning in a holistic way. This approach is void of the restrictions often imposed by teaching discreet subjects. Purposeful integration acknowledges, builds on and reinforces the existing relationships between subject areas and/or topics. The hope is that learning is then more easily transferred into other settings. Integration is also a “brain compatible strategy” as described by brain researcher, Eric Jenson. Jenson (1996) suggests that, “The brain learns best in real-life, immersion-style, multi-path learning [and] fragmented, piecemeal presenting can forever kill the joy and love of learning.” This immersion style is considered a best practice and is embraced by our teachers. It is, therefore, not uncommon for the theme, topic or unit of study to be woven into the fabric of an entire school day, week, and/or month. For example, the element of water and its states of matter are introduced in kindergarten. First grade elaborates on the water cycle and studies rivers and oceans. During these units, water often becomes a central theme that invites cross curricular learning. Centering offers cross curricular learning opportunities. 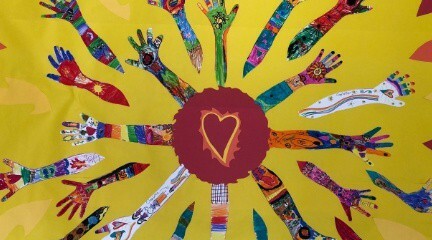 The intended purpose of centering is to awaken the spiritual center of each child, opening pathways to learning. The centering practice activity includes a contemplative experience, but teachers also strive to extend the learning by integrating with the academic curriculum. The Mind Jar centering serves as an excellent example. The Mind Jar begins with a conversation about the various properties of water. Perhaps prompted by photographs of water in various forms or by a book such as, The Water Dance by Thomas Locker. Discussion yields a shared understanding of the ways in which water moves- Water is always moving, flowing, changing, essential to life, found deep in the ocean, under the ground, high in the sky, freezing, melting, etc. The focus being more heavily on the magical and mysterious qualities of the element rather than the scientific descriptions. (i.e. a raging river can represent anger, a waterfall- excitement, snowfall- peace) After giving an example or two, the children are then prompted to suggest additional feelings and water movements connections. The teacher explains that The Mind Jar is simply a jar filled with water and glitter. But it is representative a tiny world where we can watch the movements of water and match those movements to our own feelings. The water represents our mind’s natural state and the glitter represents our thoughts, emotions, fears, concerns, and wonderings. When the jar is shaken, our thoughts will whirl around and our mind becomes cloudy and hard to see through. But, as the glitter begins to settle and still, so do our thoughts and feelings. It is in this stillness and calm state that we are able to make good decisions. 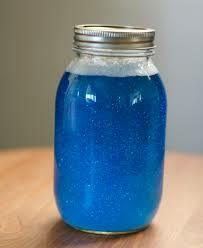 The Mind Jar is a simple mason jar containing water, glitter, glitter glue, and food coloring. Combine warm water with the glitter glue, glitter, and food coloring. Close the Jar tightly. Depending on the amount of glue you use, the glitter will settle more slowly. This tool can be used when a child is feeling stressed, overwhelmed or upset. It can calm and relax them. It can serve as a meditation tool or a self-regulation tool. You can explore many versions of this on the web. If you have an interest in extending the learning from this centering, you may want to try a follow up centering using the picture book, Moody Cow Meditates. Peter the cow is moody after having a rough day. A series of unfortunate circumstances leads Peter’s grandfather to teach him how to settle his mind and let go of his frustration using some mediation tools.